Hey, guess what? You’re coming for dinner. And I made you the Real Deal Dinner. As in corn tortillas stuffed with roasted peppers, butternut squash, and mushrooms, smothered with homemade tomatillo sauce and lovingly topped with melted cheese. I was inspired to make these mushroom enchiladas after visiting a Mexican restaurant in Montana that blew my socks off with everything good and fresh and wonderfully spicy. Wait, what? Montana is full of surprises, folks. 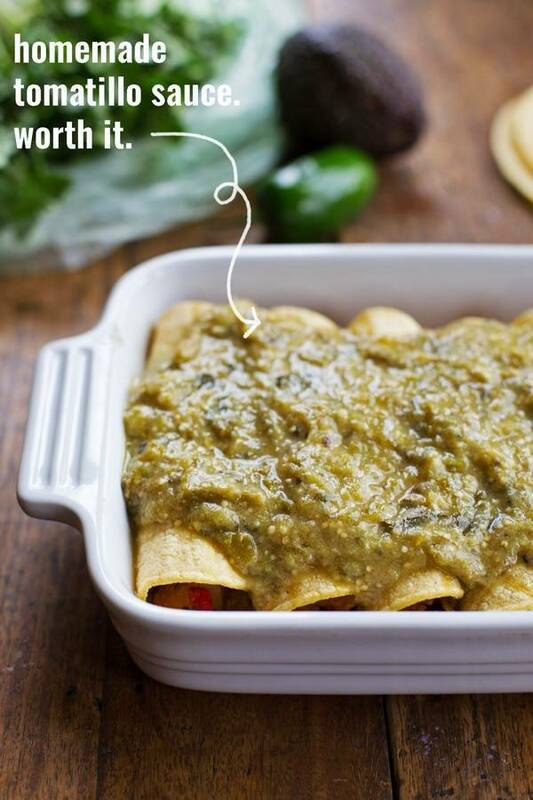 Almost everything in this recipe is made from scratch, it has incredibly fresh tangy flavor (thank you dear roasted tomatillo sauce loaded with cilantro), and the required enchilada melty cheese creaminess just makes me want to cry. One teensy tiny thing, FYI. The Real Deal Dinner requires a pretty good amount of veggie-loving time to come together. *pout* I almost never like recipes that are >30 minutes in prep. But you know what? That’s right. I just gave you a little love note in the photo. New/exciting. Think of the veggies that need your TLC here: squash, mushrooms, red peppers, jalapeños, onions, tomatillos, and cilantro. Now think of the flavors that will pop your mouth once you give them the attention they want. Even with the prep time, once you have the filling and the sauce made, you’re on EZ street. Plus I’ve been known to make the filling and the sauce and just keep it in the fridge for a quick mini pan of enchiladas mid-week. It’s just friendly food, guys. Speaking of guys, my guy reports that he reeeeally liked these and they were so so sooo good but he just wished they were chicken. Even though my inner veggie lover cried a little bit, it’s alright. He brings me back down to earth and reminds me that there are people in this world would rather not have mushrooms in their enchiladas. gasp. But those of you who get me on this? I know you’re out there, and I can’t wait for you to come over for dinner. YOU’LL LOVE THEM. So back to the food. While it’s all cookin’ up, get your buckets of toppings washed and chopped and crumbled, because it’s the right thing to do. And once your lovely enchilada cooking sesh is done, you will scoop out a few of those bad boys onto a plate and you will let the toppings flow generously and you will have yourself a plate full of mighty fine butternut squash and mushroom enchiladas covered with homemade tomatillo sauce. 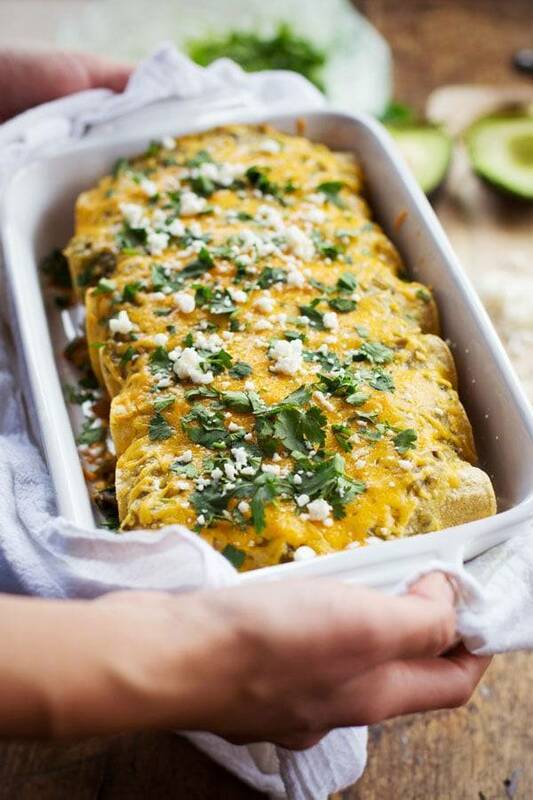 These Butternut Squash and Mushroom Enchiladas with Tomatillo Sauce are vegetarian and packed with delicious flavor. So yummy! Sauce: Remove the husks and place the tomatillos on a greased baking sheet. Roast for 20 minutes at 400 degrees, until the skins have brown or black spots on them and the tomatillos are soft. Place in a blender with the garlic and cilantro and puree until mostly smooth. Transfer to a saucepan and add the broth. Simmer for 20 minutes, until the sauce has thickened. Add the cream and season with salt. Squash Filling: In a large nonstick pan over high heat, roast the jalapeño and bell pepper. Do not stir too often; let the skins get browned and roasted. Add the onions and saute for a few minutes. Add the squash, 1 tablespoon butter, cumin, chili powder, and salt; saute until the squash is fork tender. Set aside. Mushroom Filling: Place 1 tablespoon butter back in the pan; add the mushrooms and saute until soft and browned. Season with salt and additional cumin and chili powder. Assembly: Preheat the oven to 400 degrees. Wrap the tortillas in a moist paper towel and warm in the microwave. Stuff the softened tortillas with a little bit of squash and mushrooms. Roll and place seam-side-down in a baking dish. Repeat until finished; cover with sauce and top with cheese. Bake for 10-15 minutes until cheese is melted and bubbly. Serve with your favorite toppings. This recipe was perfect for us because even though it makes a ton of enchiladas, you can just keep the filling and sauce for a few days and then make a few enchiladas throughout the week as needed. As written, the filling would stuff about 20-25 small corn tortillas. The size of pan to use will depend on how many you’re baking at one time. PS. Thanks again for all your kind and caring comments and emails showing concern for those in the Philippines affected by Typhoon Haiyan. Please please please, on behalf of all of our friends in the Philippines, if you are able, please consider giving to support relief efforts through an organization like Unicef or World Vision. Our friends in Cebu are safe, but so many people in the surrounding islands are without FOOD and WATER. Stores are being looted, communication lines have been cut off, and the situation is becoming increasingly violent as people become desperate to get what they need to survive. This looks amazingly delicious! Praying for the Phillipines. These look KILLER!! The toppings (!! ), the butternut and mushrooms the homemade sauce! Yum! I want them all! I want one for every meal! YUM! These look fantastic! My husband is constantly requesting tacos for dinner, and I like having some Mexican alternatives. A girl can only stand tacos for so many meals in a row! What can I say, I just love (LOVE) cilantro! Thanks Nila! Glad it’s just what you’ve been craving! These look lovely! I’m trying to make more veggie dishes, and love that I can use something seasonal + Mexican here (squash). I’m excited to make these for dinner tomorrow! I just finished washing & prepping all the veggies so I’m good to go after work. Question. Does this dish freeze well ? Like could I freeze the filling once it’s made? Also, re. Philippines relief, Gawad Kalinga is an excellent group. Post-recovery, rebuilding is going to be intense, whole cities pretty much flattened… they are well regarded and building strong houses with community input is their thing. Thank you so much Christina. Really appreciate you sharing. Ooooh…this has my name all over it! I love enchiladas and these are so seasonal with the butternut squash! Pinning now to make soon! Love a vegetarian enchilada recipe! I definitely think mushrooms would taste awesome in these, and even though it requires a bit more prep I bet they’d taste great the next day, so it;s definitely worth it! YUMUMMUMMMM! Guess what I have in my fridge that I’ve been wondering what to do with??? Butternut squash! I’m so pumped! This looks delish. As per the usual! Thanks, Lindsay! These look amazing! Such a unique way to use butternut squash. How about mushrooms and chicken together? 🙂 These look sooo good! I also like quick recipes but sometimes there are just things that are worth all the time and effort. Good call! I’ll remember that for next time (for Bjork’s anyways)! These look delish! I never thought of using butternut squash in enchiladas before, but I love it. Also, I really want to visit Montana now. So glad to hear all your friends in the Philippines are ok! Wow Lindsay, great post! I know I’ll be making this soon. My husband would say the same thing! Darn midwest meat & potatoes! 😉 The sauce does look worth it. These look gorgeous!! I made quesadillas from scratch last night, these could be my next ones to tackle! I’m always looking for vegetarian recipes that my fiancé will eat (he’s a certified carnivore). 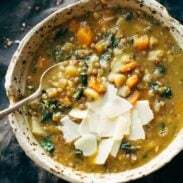 I love the combination of veggies in this one, and I can’t wait to try the homemade tomatillo sauce! I’m always on the look out for new ways to use butternut squash – my current obsession! This looks so delicious and fun, thanks for the great idea! This looks amazing! Love all the bright, colorful pictures—perfect recipe for this fall weather! Thanks for posting it!!! Mexican in Montana?!! What?!! That is crazy talk! But these sounds amazing. My husband would respond the exact same way and ask for meat…boys!